Shown above minus printer’s border, ditto engraver’s H H N and Julius Bien & Co. Lith NY. ex Walter Harvey Weed, Geology of the Little Belt Mountains, Montana, with notes on the mineral deposits of the Neihart, Barker, Yogo, and other districts... Extract from the Twentieth Annual Report of the Survey, 1898-99, Part III—Precious Metal Mining Districts. U.S. Department of the Interior, U.S. Geological Survey, 1900. Google scan of Harvard copy, here. Paragenesis — The association of the minerals with one another and their order and mode of formation constitute paragenesis... ¶ In the primary vein-filling pyrite appears to be the earliest-formed mineral, followed by blende and galena. 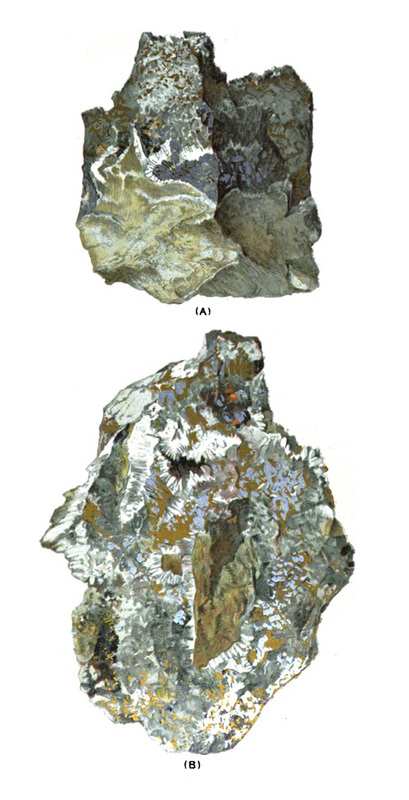 Specimens of crusted ores from the Big Seven mine are illustrated in Pl. LIV, A... cont.